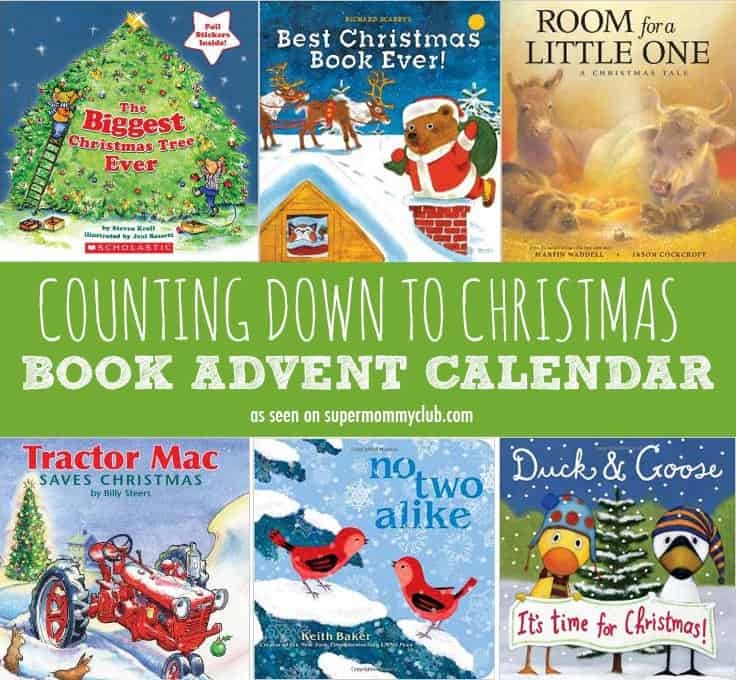 Start a new family tradition and count down to Christmas with a book advent calendar filled with wonderful Christmas books for children. A few weeks ago I shared some wonderful DIY advent calendar ideas that you could make with your children. Today I want to share how we’re going to count down to Christmas this year, and for many more I hope. We’re going to create a book advent calendar. It’s the simplest thing to do, just take 25 Christmas or winter related story books, wrap them up in brightly coloured paper and then write the numbers 1 to 25 on a sticker or gift tag and attach it to the front. Just before bedtime on December 1 we’re going to pull out the package labelled number 1 and we’re going to let the kiddos open it up, and then we’ll read the story together. We’ll do the same every night counting down the sleeps until Christmas Day. As our kiddos are only little I’m going to keep the packages hidden away and just pull out the one we need to unwrap. If your children are older you might want to put them in a basket under the tree and have them look through the packages to find the write number. We had a handful of Christmas books that the kiddos really enjoyed last year, so I’m really exciting about introducing them to some new ones this year. You probably already have a number of Christmas or winter books scattered around your bookshelves. Collect those up first and then see how many more you need to have 25. I’ve pulled together some ideas of Christmas books for children to help you fill in the gaps. Bear Stays up for Christmas by Karma Wilson – Find out what happens when Bear’s friends stop him hibernating so that he can spend Christmas with them instead. Wish Upon a Dream by Margaret Wise Brown – this is a beautifully illustrated book that you’ll want to keep out to read at bedtime all year round. The Little Christmas Elf by Nikki Shannon Smith – this is the perfect book if you have a new baby in the family this Christmas. It’s all about Nina, the littlest elf in the workshop, and a special gift for a new arrival. Santa’s Favourite Story: Santa Tells the Story of the First Christmas by Hisako Aoki – if you try to balance the story of Santa with the true meaning of the Holidays then this is a great book to read to your children. Christmas in the Manger by Nola Buck – this book is beautifully illustrated and tells the story of Christmas in a very simple way so the littlest ones can understand. What is Christmas? by Michelle Medlock Adams – a wonderful book to help even the youngest member of the family understand that Christmas isn’t all about the gifts. The Christmas Wish by Lori Evert – a beautiful story about a brave little girl who wanted to be one of Santa’s elves, and sets out on an adventure. Little Blue Truck’s Christmas by Alice Schertle – if your children are fans of Little Blue Truck they will love this Christmas adventure full of holiday warmth. The Polar Express by Chris Van Allsburg – because you can’t have an advent countdown of Christmas books without including this classic tale! A Wish to Be a Christmas Tree by Colleen Monroe – did you ever wonder about the trees that get left behind because no one picks them to be a Christmas Tree? The Littlest Elf by Brandi Dougherty – an adorable story about a little elf who gets himself into a whole lot of trouble. Rudolf the Red-Nosed Reindeer by Rick Bunsen – this one will be loved by the family for years to come, and is a wonderful reminder that you should never run away from your problems. The Biggest Snowman Ever by Steven Kroll – a fabulous tale about two little mice who set out to make the biggest snowman ever, and learn all about the need to work as a team. The Biggest Christmas Tree Ever by Steven Kroll – those little mouse are back as they search for the biggest Christmas Tree they can find. How the Grinch Stole Christmas by Dr. Seuss – and here of course is another classic tale that just has to make the list. Richard Scarry’s Best Christmas Book by Richard Scarry – the perfect choice for little ones who love Huckle Cat and Lowly Worm. You might even remember this one from your own childhood. Room for a Little One: A Christmas Tale by Martin Waddell – is the story of Christmas told from the perspective of the animals who made room for Him in the Inn. Tractor Mac Saves Christmas by Billy Steers – if your little ones are fans of Tractor Mac, or even just tractors, this tale of how Tractor Mac braves a blizzard to save Christmas could well be a favourite. Merry Christmas, Stinky Face by Lisa McCourt – is a must read Christmas books for fans of the original I Love You Stinky Face. Legend of the Christmas Stocking by Rick Osborne – have you ever wondered why we hang stockings at Christmas? The answers are in this wonderful tale. Duck and Goose, It’s Time for Christmas by Tad Hills – our favourite feathered friends go sledding and make angels in this wonderful book. No Two Alike by Keith Baker – is a wonderful book that teaches children that everyone is individual in their own way. And is a must read book for twins or triplets. The Snowman by Raymond Briggs – another Holiday Classic, this one is a no-word book so your children can look at the beautiful illustrations and make up their own story. The Night Before Christmas by Charles Santore – Christmas Eve just wouldn’t be the same without this Christmas classic. The Christmas Story by Jane Werner Watson – and why not finish off Christmas Day by reading The Christmas Story together. 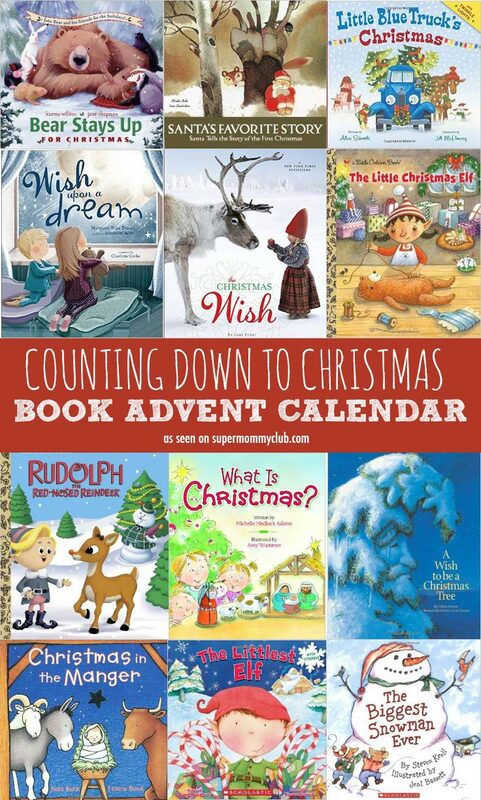 I hope your family has a wonderful time unwrapping each package in your book advent calendar!